Koh Bon & Koh Tachai are two islands located north of the Similan Islands. 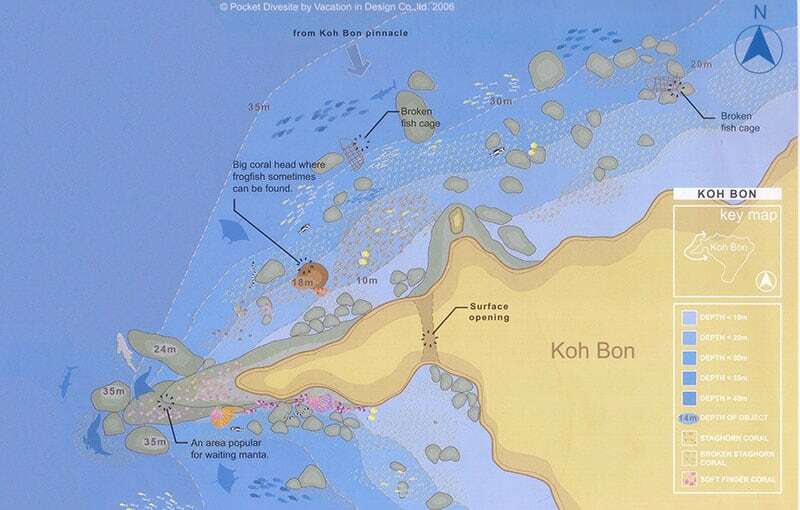 Although the Koh Bon and Koh Tachai dive sites are technically part of the Mu Koh Similan National park, geographically they are not considered part of the Similan Archipelago. Koh Bon is said to be the remains of the crater of an ancient volcano, a claim that is not confirmed but would explain why the rock that constitutes the island is dark, almost black, and different from any other island in the area. 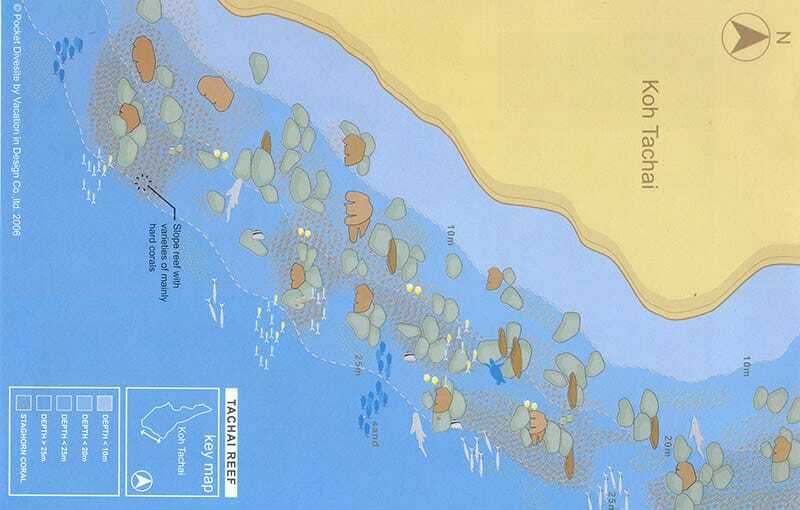 Koh Tachai is, like the Similans, a granite island characterized by large round boulders both above and below the water. Both islands offer unique underwater sceneries uncomparable with any other Thailand dive sites as well as an incredible amount of life. Koh Bon is the hot spot for Manta Rays in Thailand. Koh Bon Pinnacle is a completely submerged pinnacle situated in the blue about 100 meters northwest of Koh Bon Ridge (see below). 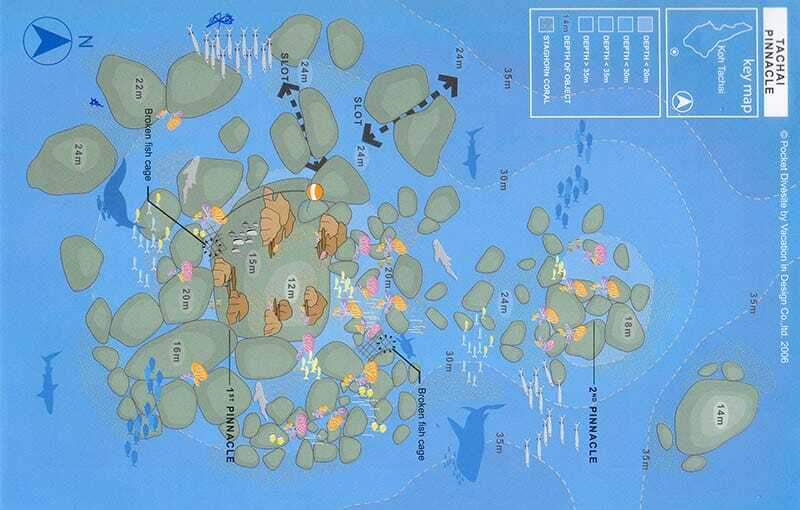 The ensemble of rocks is big enough to be a dive site of its own. Most of the pinnacle is covered in yellow soft coral, a unique trait not found in any other Thailand dive site. It’s an advanced dive as the shallowest point is at -18 m, and current is often strong. Beautiful dive site, often including Manta Rays. 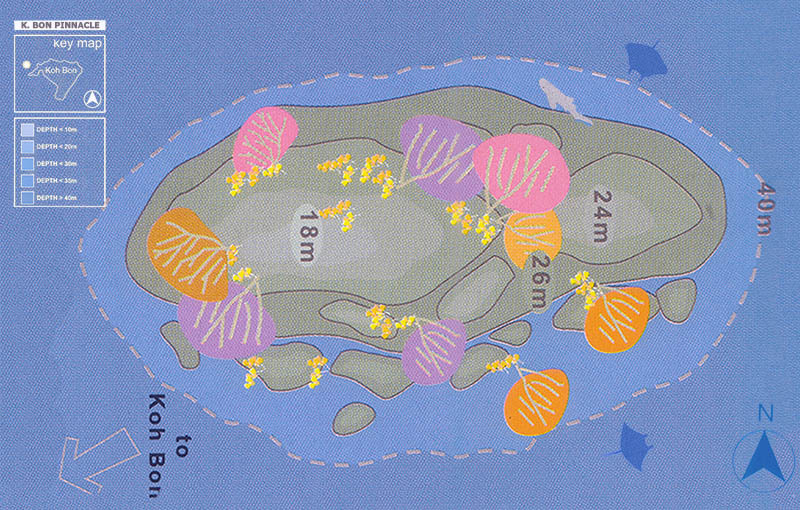 Koh Bon Ridge is the dive site that stretches around the cape on the western corner of Koh Bon Island. The stepping rocky ridge on land continues all the way underwater giving the name to the dive site. The underwater scenery is absolutely unique, with an incredible amount and diversity of marine life. Koh Bon is also the hot spot for Mantas in Thailand! Koh Tachai Pinnacle, on a good day, may very well compete with Richelieu Rock for the title of best Thailand dive site. This group of submerged boulders is, on most days, crossed by very particular (often strong) currents that attract an incredible amount of predatory fish in schools. Mantas and Whalesharks can also be encountered here with a bit of luck. Not to mention the pristine coral garden on the northern side. Tachai Reef dive site follows the sloping coastline on the east corner of Koh Tachai Island. The reef gently slopes down from the shore to a sandy bottom at around 20-25 m of depth. The reef is pretty lively with soft and hard coral bommies scattered around, all the usual reef fish and occasional pelagics passing by. Usually our favorite choice for sunset dive.